The Hartwood 8′ x 6′ FSC Overlap Pent Shed is one of the larger mid sized sheds that is on the market. The shed offers you a fair amount of storage space that can actually go far if you plan out how you store things before you put them in the shed. On the front of the shed they have cleverly put two good sized, styrene windows that are going to let in plenty of natural light. The door is not just strong and cleverly made it is also a very good size for a single door so your larger items will be able to get in and out of here with ease. Rustic overlap cladding is what they have gone for with this shed and at 8 mm thick it is just as strong as it is impressive to look at. This cladding is very well attached to the frame, so well that no rain is ever going to be able to get inside the shed and wreck your items inside. So that you can keep heavy items inside the shed and so that the floor does not feel flimsy, solid sheet boarding and a set of strong floor joists have been used. In all this is one very well made shed that is also going to be something you can use for many years. Here we have the Hartwood 8′ x 6′ FSC Overlap Pent Shed, a good mid sized shed that offers you a decent amount of space to keep a number items out of the rain, hidden away from thieves and from laying all over the lawn where you have to play a game of hopscotch just to avoid them. For a mid sized shed there is a nice amount of storage space inside of here as the depth is, 6 feet 4 inches and the width is a very impressive 8 feet. 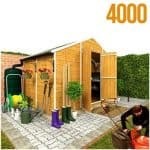 For a family looking for general storage or a person who wants a place to keep their tools and gardening items organised this shed would be ideal. At its highest point the shed is 6 feet 4 inches high so you do have a comfortable amount of headroom inside of here. We really like the way the pent roof is designed as they have made sure that it slopes down towards the back. This will keep the rain not just from sitting on top of the roof, but it also means that the rain will not be running off like a waterfall down the front of the shed. Solid sheet boarding with a covering of green mineral felt is what is used to make up the roof and this is one great and strong combination. 8 mm thick overlap cladding is used for the walls and this is very robust, rustic looking and in general some very cool cladding. We really like how they have chosen this cladding as it not only has a very unique look, but it also stands up against the rain, wind and snow so that your belongings are always safe from the elements inside here. Not only have they used a 28 mm x 28 mm frame inside the shed, they have made it connect so well to the cladding that it makes the shed very strong. Not just strong, but long lasting as well. Some sheds can get a little weak as the years go by, but thanks to the frame and the design of the shed in general, this is a shed that will stay firm for many years. Solid sheet boarding is what makes up the floor and this along with the floor joists gives you a flooring that is very strong and able to handle a whole lot of weight. You could easily have a bench, a ton of tools and heavy gardening equipment and much more. Plus as the floor is so strong when you walk inside here, you do not feel like you are walking on eggshells. 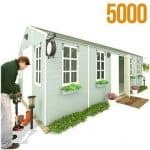 This is not a premium shed so it will be only given a very basic, basecoat treatment which will look after the shed during delivery, installation and even its early days of life. But you will want to give it a good coating of wood treatment within a couple of weeks to make sure the shed is ready to fight off rot. Wood treatment is not just a one time deal as the wood will need to be treated on a yearly basis to ensure that it stays rot free. A ten year anti rot guarantee comes with the Hartwood 8′ x 6′ FSC Overlap Pent Shed, and this is valid and will have you back as long as you treat the shed properly. Considering the door is just a single door, the size of it is actually quite impressive. They have made it so you will not have any hassle getting larger items into the shed. The actual door is also very well made and secure thanks to the heavy duty hinges that have been used to secure it to the shed. On the front of the shed there are two shatterproof styrene windows. Having two windows on here was a pleasant surprise and the way that they are not going to smash and leave broken glass every way makes this a very family friendly shed. The windows do not open which we will admit is a little on the disappointing side, but while they will not let fresh air into the shed they will let in a lot of natural light. The door has a hasp and staple on it so the door will close firmly when you are finished with the shed, but to lock the shed you will need to purchase a padlock separately. While they do offer a Yale Hasp Steel Black Finish 120 mm & Brass 40 mm Padlock for £19.99, we do feel they could have just thrown in a padlock. As the windows are right on the front of the shed there is a little bit of a lack of privacy here. So you may want to add some blinds, curtains or some type of fabric over the window to give yourself that little bit extra privacy. While the design of the shed is very rustic and you may be tempted to give it a coating of a darker or lighter brown. We feel that even a brighter colour like a red or a green would look great on this shed and actually there is plenty of different wood treatments that are coloured so have a look at those. The hasp and padlock is not the only extra that they have on offer here. They do also have a plastic shed base that is designed to keep the shed from sitting on the grass which will help protect the flooring. While this is a great idea and would be practical for those of you who have to install this on grass, at £119.99 it is a little bit highly priced for us. The overlap cladding and the frame really do make this one very high quality shed. It may not be the fanciest shed on the market, but we are still very impressed by this. This is the kind of shed that is going to last many years, but keeping it protected from rot is down to you so that is something you will have to keep on top of. 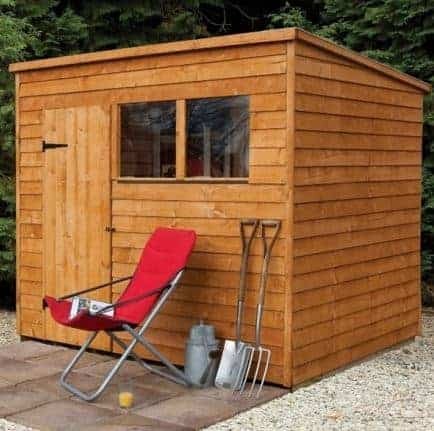 Sure this is not a large shed, but we do feel that for most people this shed does offer you a nice amount of storage space and if you are willing to really think about how you place things then this storage space can go very far. Even at 8 feet wide this is not a terribly hard installation process. Be sure to get a friend to help, follow the instructions and have plenty of snack breaks and you will find this to be a pretty pleasant experience. 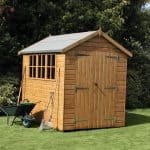 The storage space on offer here we feel is find and the overall quality of the shed is great. Once installed we are sure you are going to feel that you got very good value for your money. 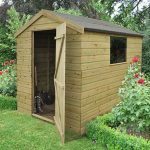 Final Thoughts: The Hartwood 8' x 6' FSC Overlap Pent Shed is a decent sized shed that offers you a secure place to keep a number of items safe from our unpredictable British weather. One of the things that we really like about this shed is that it is perfect for just so many people. 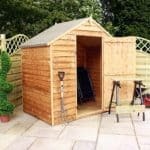 Families would find this a good sized shed as it can handle bikes, toys even larger things that they use in the summer months. It is ideal for those people who like to potter around and have a space to keep their tools and gardening gear. In general this is just a great shed that we are sure is going to be very popular with all different kinds of people.